Have you ever wanted to live a simpler life? Click here to play! Have you ever dreamed of watching the sunset from the porch, rocking back and forth in your favorite rocking chair with a stick of wheat hanging from your mouth and the hound sitting at your bare feet? Live the life of a hillbillie in search of your fortune. If you're lucky you might just strike it rich while washin' the pigs and sippin' moonshine. Pop, Betty Sue and Jeb Hillbilly will help you settle into the hillbilly way. They only appear on selected reels, but spin Pop or Betty Sue in any winning combo and you'll double your prize money. Spin Jeb and get five times your prize! If you find yourself with five hounds, you'll get 250 times your original line bet. 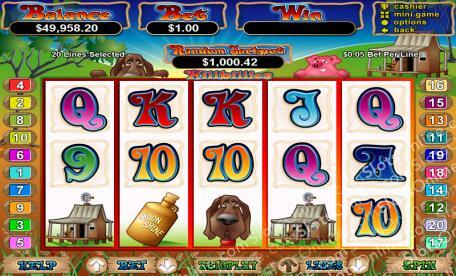 Two to five pigs win up to 200 times your bet, and five shacks will win 150 times your bet. Watch out for the moonshine as well because it packs a punch. Five jugs get you 150 times your bet. Pop, Betty Sue and Jeb have a few other tricks up their sleeves, as they also act as scatters and will trigger a bonus game in which you can play for free games. Strike it rich with the Hillbillies and you'll be happier than a pig in slop! Pop, Betty Sue and Jeb Hillbilly act as scatters. Get two or three of these charaactes anywhere on the board and win up to ten times your total bet. Two or more Hillbillies anywhere on the board will trigger a feature that awards you with eight free games. All prizes are doubled during the free games, except the Hillbilly Bonus. If you get hillbillies on reels 1, 3 and 5 during a free game, you will get the Hillbilly Bonus in which you will be rewarded with 2, 2 or 5 times your triggering bet plus it is added to the payline and scatter wins. Pop, Betty Sue and Jeb all act as substitutes. They only appear on reels 1, 3 and 5 but will substitute for all other symbols. If you spin Pop or Betty Sue, your prize will be doubled. Spin Jeb and your prize gets multiplied by five.